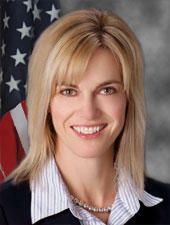 Public Service Commissioner Julie Fedorchak. Cenex is proposing to replace part of a refined fuels pipeline that runs from its Laurel, Montana refinery to Fargo. The portion to be replaced runs from Sidney, Montana to Minot. It would be upgraded from 8 inch to 10 inch diameter pipeline – at a cost of $160 million. The pipeline carries gasoline and diesel fuel. Public Service Commissioner Julie Fedorchak said this portion of the pipeline would be re-routed – so it would run from north of Sidney and north of Williston to Minot – crossing the Missouri River in Montana. "In its application, the company said it chose this route to minimize the amount of construction taking place in sensitive areas," Fedorchak said. "It also avoids difficult river crossings, as well as other numerour engineering and land-use challenges." The PSC has scheduled public hearings – to be held in July in Minot and Tioga. Fedorchak said there may be opponents – who just don’t like crude oil pipelines. "We want to have a very open and transparent hearing," Fedorchak said. "We want to hear from everybody. Everyone will get a chance to speak. But we are not going to be naive." Fedorchak said Cenex has been working on replacing sections of that pipeline – which was first built in the 1950s and 60s.